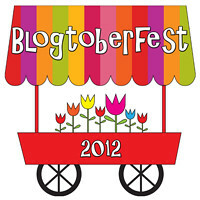 Yesterday while catching up on my blog reading I was introduced to an annual event called Blogtoberfest. I've never heard of it before, but after reading what Erin at Knitting in Beantown had to say I thought it was worth a look. It's hosted by Kat at I Saw You Dancing, and here's the description from her page.. This year, Blogtoberfest will be hosted here @ I Saw You Dancing. This will be your HQ for creative prompts, insights and inspiration from guest bloggers, and quotes to get you thinking. Be sure to check in every day during the month, fill up your creative well, and let us know how you're traveling. I am really looking forward to meeting you all -- both seasoned participants and brave newcomers -- during the month of Blogtober! My initial reaction was, I'd love to do this, but there's no way that I can blog for 31 days in a row! I was relieved to learn that the 31 days is not a requirement. There really are no rules. It's feels a bit like a workshop where you can participate in all the events or only the one's that strike your fancy. You can sign up anytime by adding your blog to the linky tool that Kat has set up. As of this morning there were 302 participants! (I'm #298) I'm quite excited to check out some of the others who are joining in. I always find it interesting to see how different people interpret the same prompt. It looks like there is a really diverse group which means the sky is the limit for what we'll see. In addition to meeting new people, I'm looking forward to learning things that will help make me a better blogger. This may not be your 'thing', but I encourage you to take a look and consider giving it a try. We all have something worthy to contribute - why not share what you have with Blogtoberfest? Today's prompt is Savour your Saturday. For me this is an easy one. After spending the morning working on the blog, I'm going to shut my computer off, make myself a cup of tea, put a movie on and spend 2 quality hours with my hook and yarn! Thanks so much for the trackback/shoutout! I am enjoying this so far. We'll see how long I can sustain the daily posting....but as you say, there are no rules or requirements, no pressure. If increased traffic is one of your motivators, you might be interested to know that my stats have more than doubled in the past four days. Have fun!!! You bet Erin! I didn't even think about stats - but that's a bonus for sure. I'll be stopping by to see how you do with the daily posting! Good for you taking some time to relax away from technology for a while. I'm sure that you will get some crocheting done! Thanks for sharing this event, I wish I could devote time to it. It feels good to just step away. As much as I love my cyberhood friends I'm trying to give myself regular breaks. it's helping to keep me focused and fresh. Welcome! I am back for my second year of Blogtoberfest. You may actually want to try blogging every day (maybe not this month since you just learned about it!). It encourages you to try different types of posts and that can be very cool. Thanks for the tip Marie. I do like the idea of trying new things, and moving beyond my comfort zone. After your suggestion I'm considering doing a month of posting this winter - Maybe January or February. I am enjoying meeting lots of new people with completely different interests! Thank You for sharing about this! I'm headed over right now to sign myself up! No problem Tracy! That's what it's all about. Have fun!